Hello, and welcome to our GoBarging website. We'd like to introduce you to the European waterways, to the world of GoBarging. 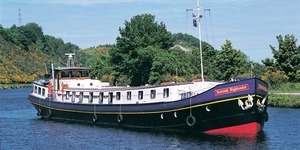 Our luxury hotel barges cruise the inland waterways of nine European countries, along canals, rivers, lakes and lochs. This is an opportunity to visit these countries and experience life there, from a truly unique perspective. Your floating hotel cruises gently along, while you relax, enjoy the fine wines and excellent cuisine, the company of fellow passengers - new friends, family, or old acquaintances. Take a guided tour around the many castles, markets, battlefields and ancient monuments, or go off exploring on your own. Whatever you do, our dedicated and highly trained professional staff will be there to look after you. Our Captains ensure a safe and yet exciting passage along your chosen route, our Chefs prepare a wide range of exquisite food to suit every taste, our Tour guides are knowledgeable and enthusiastic, and our stewards & stewardesses ensure that our high standards are maintained throughout your cruise. If you are new to barging, have a look at our Barging Video, take a tour of our Barge fleet and read our GoBarging FAQ to find out more about barge cruises on the European Waterways. You can then use our Cruise guide to find a country, region and barge of your choice. Every barge page has its own menu, offering you lots of information on the unique merits of each barge. We offer a wide range of Theme cruise charters too, from Golf cruises to Wine cruises, and our Theme Cruise guide will help you to find a theme cruise to suit your needs. 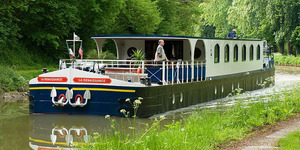 We provide cruise rates and you can check availability for any barge and your preferred cruise dates. You can request a brochure, download a copy, or have one mailed, and why not subscribe to our monthly newsletter the Lockkeeper, where we feature different barges each month, provide cruise news and offers. So, welcome once again, and we hope this website gives you a taste for our unique barging world. Is European Waterways your company? Register to get access. You can get access to the Offerings listed on TravelDragon, allowing you to add/edit your products. Register as a provider if you'd like to edit these Offerings and become a member of TravelDragon.